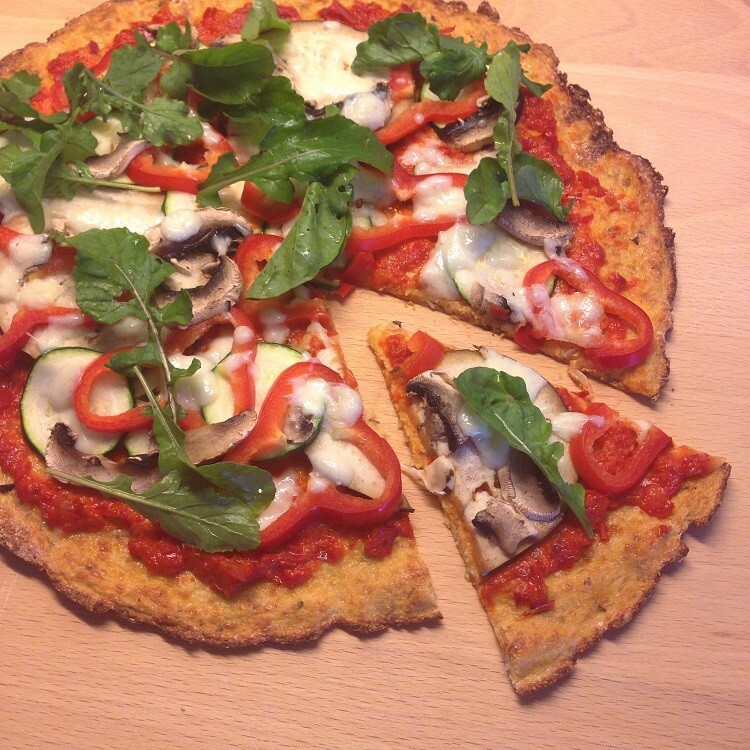 Cauliflower crust pizza is notorious for being a bit more difficult to make. Difficult in the way that it is highly likely that the crust won’t hold together and you won’t be able to hold a pizza slice in your hands. So I’ve been searching for a perfect recipe for quite a while, comparing the ingredients and trying to figure out which one might turn out great. I really wanted to succeed in the first try because I’m pretty sure I would have given up if I failed at my first try. So I found this recipe and decided to give it a try. 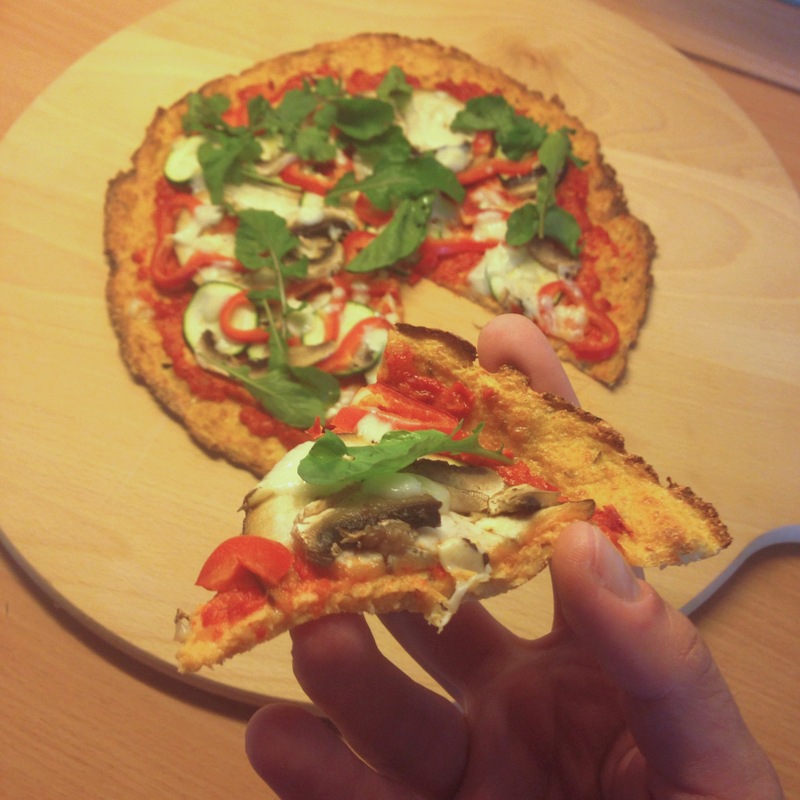 If I can give you one piece of advice that you should really stick to it would be – make sure you are really thorough with step 4, meaning you should really make sure you squeeze out any and all liquid since this is the stage that can make or break your cauliflower crust. Literally. If you don’t remove all the excess liquid, your crust will not hold together when baked and you will not be able to hold a slice of this pizza in your hands and eat it. Which kind of takes all the fun out of eating pizza. 1. Preheat oven to 190 degrees Celsius and line a baking tray with parchment paper. 2. Rinse cauliflower, remove any outer leaves, separate into floret and place the florets in a food processor. Process until “rice” textures. 3. Place on a prepared baking sheet and bake for 15 minutes (in some recipes, this cooking part is made in the microwave but it takes 10 minutes as well which is why i think using the oven is healthier and doesn’t take that much longer). Remove from the oven and transfer to a bowl lined with double layered cheesecloth. 4. Squeeze the liquid out of the ball, cauliflower inside the cheesecloth, as hard as you can. Keep in mind that the cauliflower will be really hot so I suggest using gloves. Make sure you really squeeze out any and all liquid. 5. Increase oven to 230 degrees Celsius. Transfer cauliflower to a mixing bowl along with the egg, Mozzarella, oregano and salt and mix to combine. Transfer the cauliflower mixture to a baking tray, lined with parchment paper, and flatten with your hands until thin pizza crust forms. Do not make it too thin so it won’t break under the pressure of all the toppings you will be adding later. 6. Bake for 15 – 20 minutes and remove from the oven. 7. Top with your favorite toppings and bake for another 10 – 15 minutes or until the cheese on top turns golden brown.